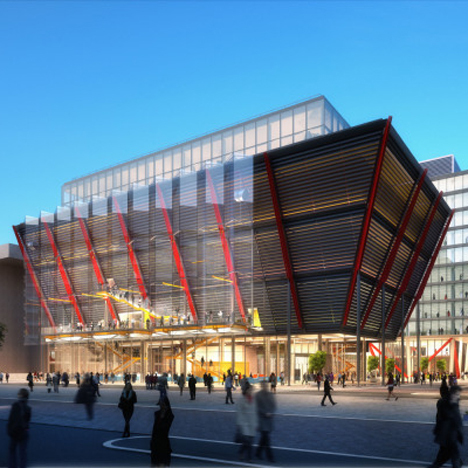 Rogers Stirk Harbour + Partners has released new images of its design for a six-storey building that will house the International Spy Museum in Washington DC. The contemporary building is slated to rise in L'Enfant Plaza – a large, historic plaza encircled by commercial buildings in the city's Southwest quadrant. Renderings show an upside-down trapezoid sitting atop a single-storey base clad in glass. The roof features a two-storey glazed pavilion. Bright red columns are visible on the exterior. The colour regularly features in structures designed by the London-based architecture firm, which was founded by Richard Rogers. The International Spy Museum will contain galleries, event and retail space, classrooms and a ground-level courtyard. The courtyard will visually link the structure to neighbouring office buildings, according to the architects. The 100,000-square-foot (9,290-square-metre) building will abut L'Enfant Plaza Hotel, which has been closed since December 2013 as its undergoes renovation. The Modernist hotel, designed by Vlastimil Koubek, opened in 1973. The International Spy Museum and its development partner, JBG Companies, submitted the building design on 16 July 2015 to the US Commission of Fine Arts, which must approve the concept before work proceeds. The local firm Hickok Cole Architects is serving as executive architect. The design is a modified version of a concept submitted to the commission in April. Following that meeting, the commission stated in a letter that it "endorsed the project with enthusiasm and approved the general concept, requesting further development of the design for a revised concept submission." The museum is currently housed in a historic red-brick building in downtown Washington DC, in the Pennsylvania Quarter neighbourhood. With its lease ending in 2017, the museum has been searching for a new location. Last year, the museum proposed turning the Beaux Arts-style Carnegie Library, which opened in 1903, into its new home, with a design by Philadelphia-based MGA Partners and the landscape architecture firm Olin. It withdrew the proposal after the city's historic preservation board said it did not meet its guidelines. The museum, which opened in 2002, is the only public museum in the US focused exclusively on espionage. Its collection of spy-related artefacts includes a 1980s coat with a button that doubles as a hidden camera and a letter written by George Washington in 1777, authorising the establishment of a spy network in New York. Rogers Stirk Harbour + Partners' Neo Bankside housing development in London, which also features red details, has been shortlisted for this year's Stirling Prize for contribution to British architecture. Its bright red Maggie's Centre, a cancer care centre in London, won the same prize in 2009. Other recent projects by the firm include an adaptation of a 70-year-old modular Jean Prouvé house, and the Leadenhall Building – also known as the Cheesegrater – a skyscraper in the City of London with a slanting profile.